An [email protected] Cinderella Girls character in the Passion (Yellow Sun) category. She is 17 and is notable for being relatively large compared to the other idols, at 182cm and 60kg (5'11.5" and 132 lbs. ), with measurements of 91-64-86 (36"-25"-34"). She even continues to grow after training. For comparative purposes, the tallest main character in classic [email protected] is Shijou Takane at 169cm and 49kg (5'6.5" and 108 lbs) and the tallest main character in [email protected]: SideM is Kurono Genbu at 190 cm and 65 kg (6'3" and 143 lbs). She loves collecting cute things, and has a fun, excitable personality, which is embodied as Kirarin Power, as well as an always-present :3 visage. Fan art often depicts her as being superhumanly strong and prone to accidental destruction. As one of the most popular Cinderella Girls characters, she was selected for the second CINDERELLA MASTER CD series, alongside Kanzaki Ranko, Maekawa Miku, Jougasaki Mika and Shimamura Uzuki. Her seiyuu is Matsuzaki Rei. 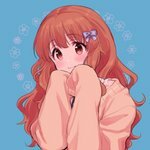 She is in the unit "Ankira" with Futaba Anzu, as well as "Decoration" with Jougasaki Rika and Akagi Miria, and their unit costumes are Pikapikapop in the anime.